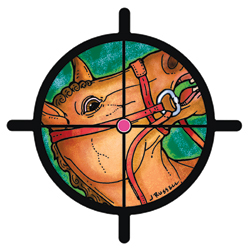 When you hear horse enthusiasts, racers and breeders arguing that slaughter is a better option than other "disposal" methods for when their equine charges are old and tired, it becomes evident that the horse trade is yet another human enterprise driven by profits and with no good answer for what to do when its "product" has outlived its usefulness. Greyhound dogs are similarly unappreciated, living miserable lives goaded into chasing and tearing the heads off hapless rabbits in preparation for showtime, only to end up with nowhere to go but to the sting of the euthanasia needle unless lucky enough to be chosen for a volunteer adoption program. 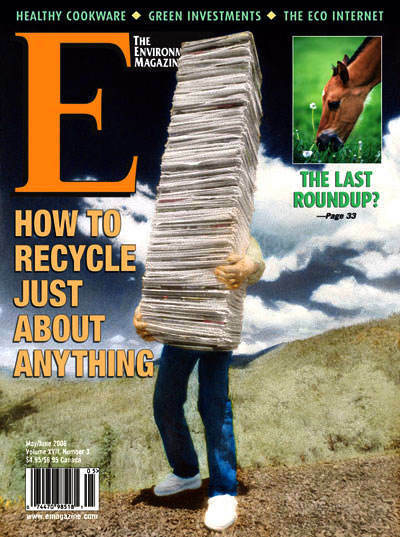 The cynic might call this the definitive recycling program, rendering no longer productive race horses or equine cowhands into meat and other consumables, even as more are cranked out by breeders to spend their lives in service to human selfishness until it’s their turn for the proverbial glue factory. Is this an environmental story? In the larger sense it is. I believe that all the green issues we fight for—from open space and toxic waste to air and water quality and health—don’t begin and end just with human concerns. Otherwise we practice the worst form of religious extremism, which fantasizes that some unseen power has decided that the 15 to 100 million species on this planet (the range of estimates, showing how little we know) are all here to serve us and have no other purpose. We share this planet with numerous other life forms and this great Earth belongs to them, too. And no matter what predator/prey relationships exist that fit with Mother Nature’s plans, the ones we direct—from "factory" farming systems that brutalize cows, pigs and chickens while seriously polluting the environment, to laboratory work that grinds up species in the name of new shades of toxic eye shadow—are driven entirely by greed, not need. In many issues involving animals, from so-called "invasive species" misplaced by human error, to animal "pests" whose nuisance factor is only relative to the ever-encroaching human footprint, our knee-jerk prescription is almost always death. Here in Connecticut we have a growing colony of parrots (monk parakeets) that arrived some time ago through an incident probably involving the exotic bird trade (see Currents, this issue). They are delightful to have around, but of late they appear to have colonized some of those lovely cell phone tower "trees," prompting those afflicted with TedNugentitis to propose simply doing away with them (the birds, that is). Our relationship with animals is important to address alongside the other issues we work on that, collectively, amount to a re-evaluation of our whole relationship with the natural world, which right now is seriously broken. And in the face of avian flu, mad cow and a host of other emerging diseases that result from unnatural human-animal contact in a world reeling from climate change (which may be a factor) and other monumental problems, another slaughter industry is hardly good for either man or beast.